Many folks assume that they have to exercise hours each and every day to lose weight and keep it off. There are things you can do to get your heart pumping fast in just a few minutes. 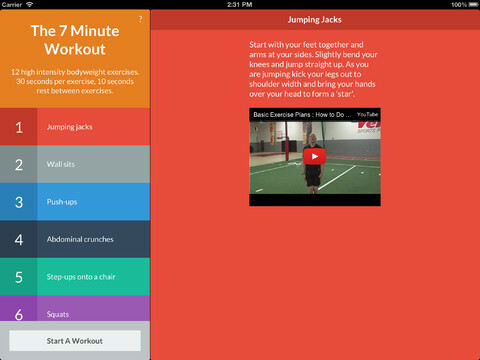 7 Minute Workout is a simple and elegant application that brings you bodyweight exercises you can get done in just a few minutes. You won’t need fancy equipment to use this. 7 Minute Workout provides you with outline of all the exercises in the workout. You get 12 bodyweight exercises and have 30 seconds to complete each. Of course, you get 10 seconds of rest between each move. Video and text description for each exercise are included. The app provides you with voice prompts for each step so you won’t even need to look at your phone or tablet. 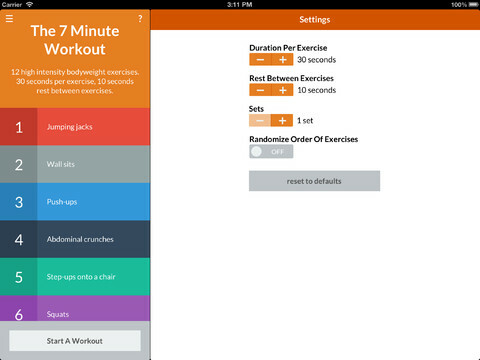 7 Minute Workout has a premium add-on that lets you set duration for each exercise, change rest time, and adjust your number of sets. It will also enable workout randomization. That sets you back under $2. Overall, this is a pretty beautiful app to use to get yourself moving even if it is for a few minutes a day.